This is the sequel to the Making Words game boards that I also have listed. 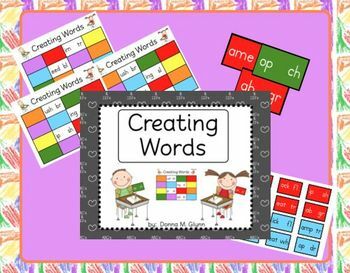 These are must haves for any literacy centers. They are based off of a game that my Lit Coach had showed to me this year and my students loved them. The children pick their game pieces and then mentally flip the letters that are on the pieces to make a word. They then use their game boards to create words using the digraph or blend. There are several different ways to play this game to meet the needs of your class.